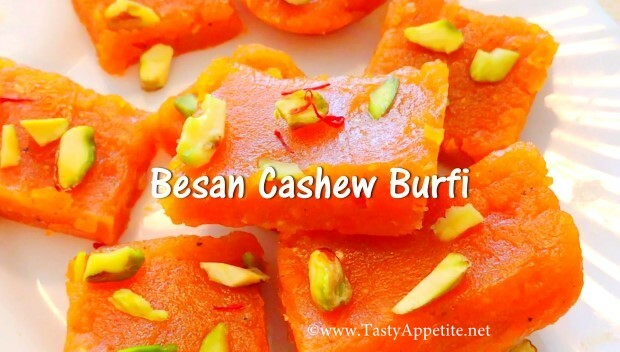 Besan Kaju burfi is a delicious Indian sweet that is loved by everyone all over the world. Making this fudgy sweet for colorful festive season is a bliss and can be prepared easily at home. It is made with roasted besan, cashew paste, ghee and sugar flavored with cardamom. Then its garnished with nuts and cut into squares. Make mouth watering besan kaju burfi with this easy video recipe! Soak cashew nuts in 1/2 cup of water for 10 mins. Add sugar and 1 cup of water and stir in low flame. Continue boiling, until the sugar syrup reaches one string consistency. Its time to add cashew paste and stir. Add besan flour and continue stirring. Stir continously to ensure no lumps are formed. Add cardamom pwd, ghee and orange food color (optional) and continue stirring. Continue stirring, until the mixture starts rolling on the sides of the pan as shown in video. Add the mixture to the tray greased with ghee. Flatten the surface and garnish with chopped pistachio nuts. Allow to cool and slice it to squares or diamonds. Let the burfi cool completely. Lipsmacking delicious besan kaju burfi is ready.